As it turns out, I make quite a lot of vegetarian meals. It’s not because I’m trying to go veggie – it’s mostly unintentional. I have noticed looking at our recent meal plans that I cook meatless meals more than half the time. More than anything I think it is just because I like to plan menus that have plenty of variety and have some healthy meals to balance out the less than healthy dishes. I certainly feel lucky to have a husband who is so willing to eat just about anything I make, and never complains one bit about missing the meat. This was my first time trying soba noodles. I’ll admit I have been a bit hesitant to try them before because I had no idea what they would taste like and they look like, well, health food. Not the kind of health food that tastes good naturally but the kind you have to force yourself to eat. I mean, they are buckwheat noodles. Even while they were boiling they smelled like health food. I was very pleasantly surprised when I tried the dish and it was good…really good. The noodles mostly tasted like regular noodles with a slightly nutty flavor. The dish was both filling and nourishing. And, it makes great leftovers. 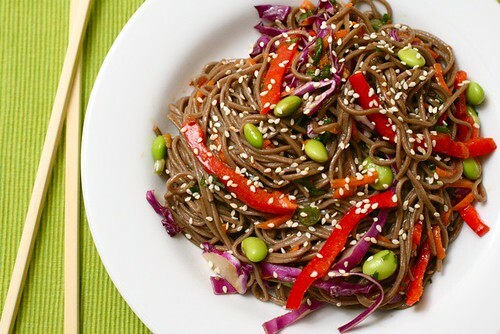 If you’re looking for a way to introduce yourself to a new ingredient, or if you are already a fan of soba noodles, give this a try. I’m looking forward to trying them in more recipes to come. To make the dressing, combine the soy sauce, sesame and canola oils, vinegar, garlic, green onions and cilantro in a small bowl. Whisk well to blend. Cook the soba noodles according to the package directions. Drain well and rinse with cold water. Transfer the noodles to a large mixing bowl with the vegetables. Pour the dressing over the top and toss well so the noodles and vegetables are well coated with the dressing. Serve cold or at room temperature and sprinkled with toasted sesame seeds.